If you would like to buy Ethereum (or Litecoin or Bitcoin as well) and want to pay for it using your PayPal account, just read this short article. I will explain how to do it. The only website that I know that sells Ethereum and accepts PayPal payments as well, is eToro (it is not available for USA citizens though). Besides Ethereum, Litecoin and Bitcoin they also offer other trading options. For example, you can invest your money into stocks, commodities, world currencies, etc. So if you want to buy Ethereum with PayPal, just go to the eToro website and sign up. Without the verification of your profile you can invest up to $2,000. Or, if you verify your profile, there won’t be any sum limits. To verify your account, you will just need to upload a legible color copy of your national ID or passport. Then to buy Etherem just click the blue button “Deposit Funds” in your eToro account menu at the bottom on the left. 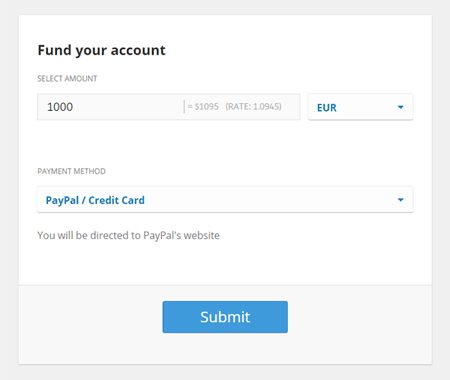 In the next step just choose PayPal as your payment option and you will be redirected to the PayPal website on which you will make the payment.